or, to be more precise, whoever manages to find me. 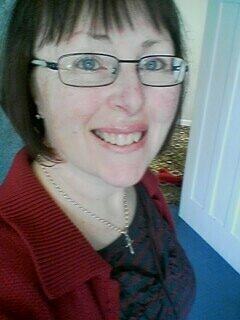 My name is Lynne and I live Downunder, otherwise known as New Zealand, in a beautiful small coastal city. Moving right along, these are the guys I live with, now that my daughter is all grown up and moved away. This is Sophie, 14 years old and the matriarch. Looks like butter wouldn't melt in her mouth but both the other (bigger) cat and the dog give her a wide berth. She has NO sense of humour and never has. This cat didn't even play with toys as a kitten. DO NOT MESS WITH HER. This is Tasha, almost 8 years old, half-Burmese and very tall. Her highly pedigreed mother escaped for a night of passion with the neighbourhood tom, much to my friend's disgust. She gave away all the kittens, which grew up to be amazing cats. Tasha's more doglike than catlike. An efficient predator, yet a total teddybear with people. When we first moved into this house, she used to bring home rats and mice galore. Now it's just an occasional one. I think she has cleared the neighbourhood for me. I think that's probably enough for my first post. It's also 2.16 a.m. here and I had no idea it was that late. Early. Whatever. Hey Lynne, I wondered if you had started a blog. Your post on my killer tomatoes had part of the address so I wasn't sure, but todays comment had the whole thing. Congratulations!!!! I am looking forward to following your adventures. Glad to learn more about your life. Thank you so much for checking my blog out.